MEETING POINT: Dave Russell gets to grips with The Martyrs Tree on the Green in Tolpuddle where the six men met to form their trade union. They also met in the upstairs room of Thomas Standfield’s cottage. 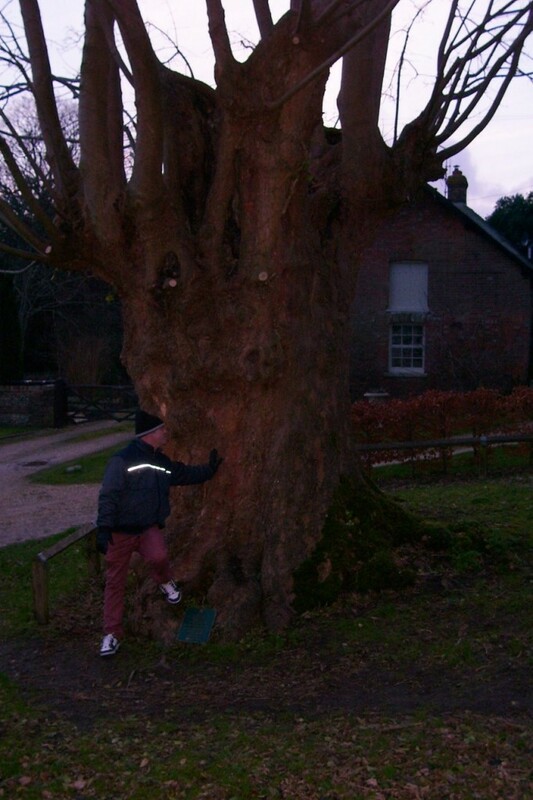 The tree is now looked after by the National Trust. In 2005 the Trust thought its age was around 320 years. MARTYRS MEMENTOS: Tom de Wit manager of Tolpuddle Martyrs Shop. 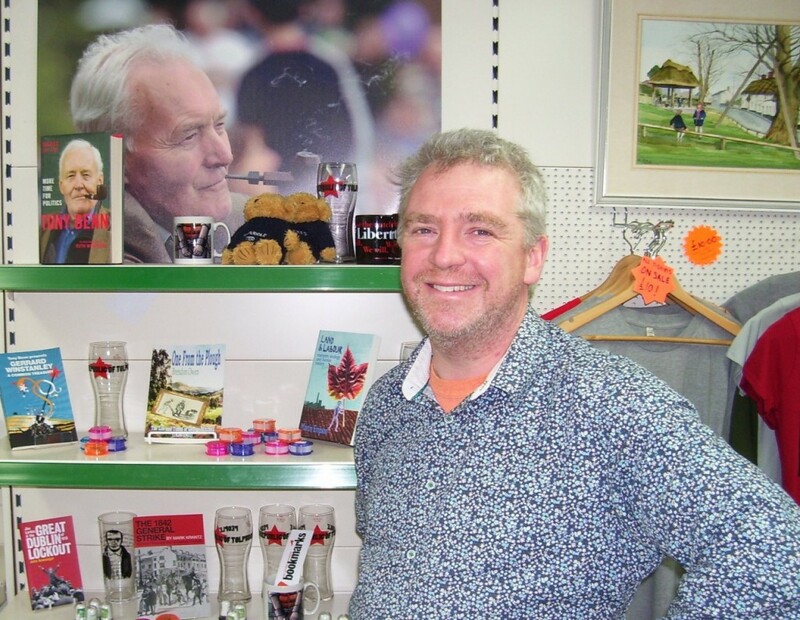 Behind him is a picture of stalwart Tolpuddle Martyrs Festival attendee and speaker the late Tony Benn. As well as the shop, CDs and memorabilia can be ordered on-line. 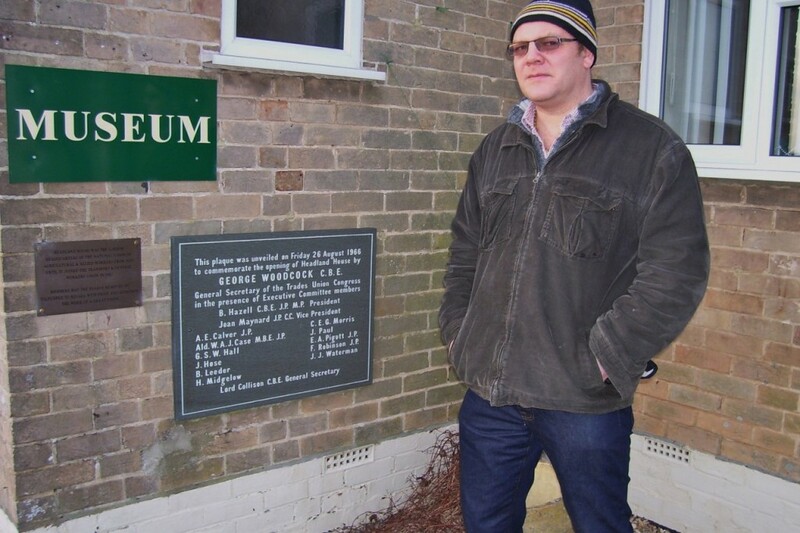 FOCAL POINT: I am pictured just outside the entrance to the Tolpuddle Martyrs Museum. Although the exhibition is free to those viewing it, a donation would be welcome to ensure it can be continually be provided for. Picture by David Russell. 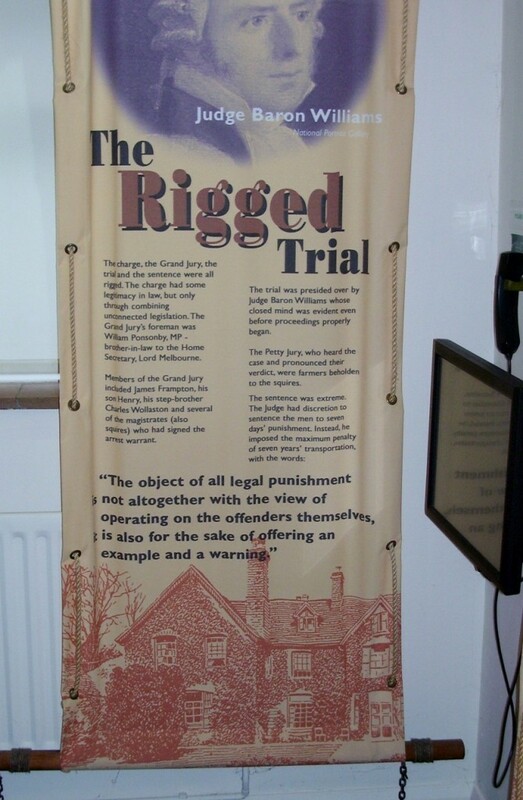 TRUMPED CHARGE: According to this information at the Martyrs Museum, there was nepotism involved in this trial of the six men as the jury’s foreman was the brother-in-law of the then Home Secretary. 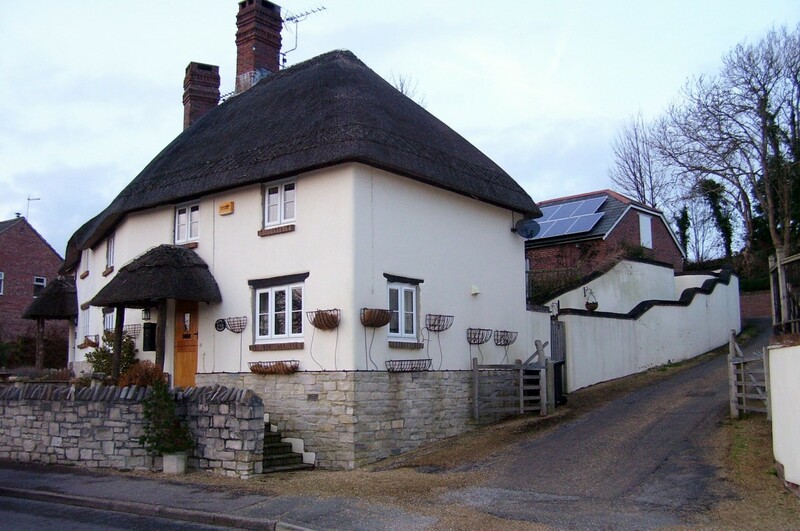 RURAL CRAFT: A house in Tolpuddle with a thatched roof. The craft is passed down from one generation to another and is the design of choice for some wishing to have a rustic look to their home. A VILLAGE in the middle of Dorset harbours the story of the founding of the modern trade union movement. I had been meaning to go to Tolpuddle and face my concerns about the doctrine of socialism but amidst all of this, six men were trying to improve the living conditions of their working environment and they should never have been sent half way round the world as punishment. George and James Loveless; James Brine, James Hammett, Thomas Standfield and his son John were charged with the illegal oath to form a trade union, basically a trumped-up charge. They would meet by an old sycamore tree in the village or the upstairs room of Thomas Standfield’s cottage. The union had been formed as they were paid six shillings a week (the equivalent of 30p in today’s money) and they had endured three wage cuts in consecutive years. Their wages had been suppressed as the industrialisation of agriculture had just begun to pick up pace. All six were charged with transportation to Australia for seven years. The sentence proved a trigger point for major protests, including a huge march in London and an 800,000-strong petition delivered to Parliament. Incredibly all six managed to return without losing their lives. Conditions on the ships out there were very grim and once they had reached New South Wales or Tasmania in Australia, many died of disease. Whilst they were away, the Martyrs’ families were sustained by voluntary donations and constant pressure forced the Government to relent and they returned with free pardons and in the eyes of many in the country, they were heroes. The Government also had acted with caution when as the French Revolution had only taken place a few years before. As well as the central story to this village, Tolpuddle boasts several traditional thatched roof properties; St John The Evangelist Church; the Martyrs Inn and a Tudor house open to the public that is a mile to the west of the village. The famous Sycamore is still there in the village but visibly aged. Tolpuddle Martyrs Museum consists of a row of cottages said to have been resided in by the men and a well-stocked shop of souvenirs run by manager Tom de Wit. The cottages were built-in 1934 and the meeting room (now the museum) were erected in memory of the trade unionists. The cottages are for the use of retired agricultural workers. A brief conversation Dave and I had with Tom revealed the late Tony Benn was a regular visitor to the festival Martyrs Festival and former Prime Minister Tony Blair also attended prior to the 1997 General Election but never came again. The three of us also discussed the current dairy crisis, so often covered on this site as many of the businesses suffering are family farms of 200 to 300 animals, not corporate-style “battery” dairy farms and many were producing milk below the cost of production. James Hammett is the only one of the six who remained in Dorset after returning from their period of hard labour. He is buried in the parish church of St John’s. If anyone is visiting and requires liquid refreshment and hot food, the Martyrs Inn is worth paying a visit and also under the same ownership as Athelhampton House. Anybody visiting Tolpuddle and the neighboring villages of Affpuddle and Briantspuddle can print this map and follow the walk marked up as 5.6 miles long. Click here for more information.